Startups and companies from other industries are nibbling at the edges of the traditional healthcare ecosystem. See some of the hottest healthcare tech mash ups that are making a splash, transforming healthcare, and appealing to consumers and investors in ways we never imagined. 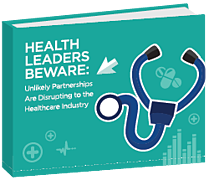 This eBook will give you insights into unusual partnerships and alliances that blur the line of where healthcare begins and ends.